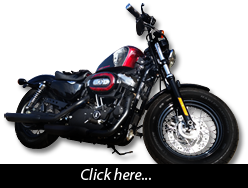 Van Vuuren Custom Paint & Airbrushing offer a complete custom paint turnkey solution for your bike. Great care and professionalism is taken before any commission is started and all paint projects are treated with the utmost care and respect that would be expected from any bike owner. The van Vuuren Custom Paint & Airbrushing process for any job consists of a couple of steps. These steps are necessary to ensure that the end product is nothing less than show quality and will last for years to come. It can include photography of the bike or tins. An inspection of the existing paint quality is also done. In most cases the original paint will have to be stripped off. A one-on-one discussion takes place in order to get a clear understanding of the paint theme requirement for your bike and advice is given. At this stage a budget will also be discussed to determine the amount of detail, size and material to use on the project. To proceed to step 3, an acceptance of the price quoted is required. In this step, close to 20 years Professional Graphic Design experience gets utilized in the birth of making your bike truly your own. The photographs taken in step 1 are used to do an actual digital design of the discussed paint theme. This will give you, the customer an accurate visual representation of layout and what your ride will look like once the job is complete. The design is also used as a proof, which need to be signed off by the customer before moving on to step 4. This is probably the single most important step of the whole process. It is a typical 'measure twice, cut once' scenario. Great care is taken in this step because everything from this stage onwards will follow through up to the final product. It might include the stripping-off of old paint and in almost all cases, the application of new primer. Great skill and knowledge is the hero of the day in this step. Only the best available paint and equipment are used to apply unique creativity to your bike. This is also the longest step of the process to complete. Photorealism and exceptional attention to detail play a big roll and consist of a couple of steps in itself to complete. The cherry on the top. There is only ONE way at the end of the day to achieve show quality in a paint job. It can only be achieved with the highest quality and shine clear coat. On all projects, a UV resistant, high shine clear coating is applied to enhance the color of the artwork and to provide protection for your rides new paint. After the clear coat has dried, the final process of scuff, buff and polish takes place. The end result is a surface as smooth as glass.